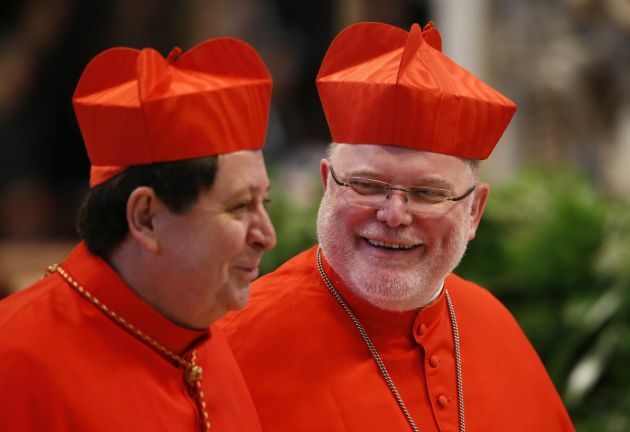 (Photo: REUTERS / Stefano Rellandini)Cardinals Reinhard Marx (R) of Germany and Joao Braz de Aviz attend a mass in St. Peter's Basilica at the Vatican March 12, 2013. All cardinals, including those over 80 who will not vote in the conclave, celebrate Mass in St Peter's Basilica to pray for the election of the new pope. The Mass is called "Pro Eligendo Romano Pontefice" ("For the Election of the Roman Pontiff") and is open to the public. Germany's Catholic Church took a hit in 2015 with almost 200,000 members leaving, but the country's top bishop believes the church is still a strong force with its message being heard and accepted. Figures released July 15 by the German bishops' conference show an ongoing decline of Catholicism in Germany, the Catholic News Agency reported. The head of the conference, Cardinal Reinhard Marx of Munich and Freising, however, described the as a continuing "strong force, whose message is heard and accepted." The church has more than 23.7 million members in Germany and Catholicism is the largest single religious group in the country, accounting for 29 percent of the population. In that year 181,925 people left the Catholic Church while a miniscule 2,685 people became Catholic, and 6,474 reverted to Catholicism. The figures show a constant decline in people attending Mass, vocations to the priesthood and sacramental marriages in Germany. Twenty years ago the official statistics of twenty years ago showed that almost 260,000 babies were baptized, but last year that slid to just over 167,000. When it came to marriages the numbers told an even bleaker story. Twenty-one years ago, 86,456 couples tied the knot in church. In 2015, the number plummeted by almost half. Out of Germany's 80 million people, only 44,298 couples were married in the church last year. Marx said in a statement, "The statistics show that the Church in Germany continues to be a strong force, whose message is heard and accepted. "There obviously not only is an interest in, but also an active desire for the sacraments of the Church, as the slight increase of baptisms and marriages proves," he said. Recognising the high numbers of people leaving the church, Marx said: "We need a 'sophisticated pastoral practice' that does justice to the diverse life-worlds of people and convincingly passes on the hope of the faith." Pope Francis issued a cutting analysis of the decline of the Catholic faith in Germany since the 1960s on the occasion of the German bishops' during a visit in 2015. He called on the bishops to re-introduce people to the Eucharist and confession during the Year of Mercy, to take on the new evangelization, to strengthen the role of priests, and to protect unborn life.